and legal counsel for presentation to the membership. Those who prefer can download a copy by clicking here. Constitution of the Knox County Fish & Game Association, Inc. I. The name of this organization is the Knox County Fish and Game Association, Inc.
o	The preservation of hunting and fishing. o	The propagation and conservation of wildlife. o	The prevention of pollution and misuse of land, water, and air. o	The encouragement of outdoor recreation. o	The protection and preservation of Beaver Lodge and its grounds. o	The protection and defense of the Constitutions of the United States and Maine, especially with regard to the inalienable right of the citizen to keep and bear arms, as guaranteed by such Constitutions in Amendment II and Article I, Section 16, respectively. III. § 1: Any resident of the United States of America, who is 18 years of age or older may become a member of this organization if approved by a majority vote of the Executive Committee. New members will be given a membership card, a vehicle window sticker, and a copy of the Constitution and Bylaws of the Association. § 2: Any person who applies for membership must submit a completed membership application to the Membership Committee. The application shall require the applicant's signed oath and affirmation of commitment to uphold and defend the purposes and objectives of the Association. (see Appendix for copy of Membership Application). § 3: Any member of the Association who violates any Department of Inland Fisheries and Wildlife rules, engages in conduct unbecoming a sportsman, or commits any offense against the organization or its Bylaws, may be expelled by a majority vote of the Executive Committee. Any member who is expelled may appeal the expulsion within 90 days to the members at a regular meeting. IV. § 1: The Board of Directors shall consist of and six elected Directors. V. § 2: The Executive Committee shall consist of the Board of Directors together with the President, Vice President, Secretary, Treasurer, and the other Officers who head the Finance and Budget, Membership, House, Camping, Grounds, Range, Archery, Scholarship, Fishing Derby, Lodge Rental, and Kitchen committees. § 3: Officers and Directors cannot have more than three unexcused absences from meetings during the year. If an Officer or Director does not meet attendance requirements or is otherwise grossly negligent or incapacitated, the Directors may, by majority vote, recommend to the membership that the office be declared vacant. The position may be declared vacant by a two-thirds vote of the members voting at a regular meeting. If a member wishes to propose an amendment to this Constitution, the member must introduce the proposed amendment to the membership at a regular monthly meeting and must provide copies of the proposed amendment to the membership at least seven days prior to the next regular monthly meeting. This Constitution may then be amended by a two-thirds vote of those voting at the regular meeting. By-Laws of the Knox County Fish & Game Association, Inc.
§ 1: The care, management, and control of all real property of the Association shall be under the direction of the Board of Directors, and they shall make all rules and regulations governing same. The Board shall provide direction to all standing committees. The Board shall suggest policies for consideration by the membership, vote on new memberships, and report its transactions to the membership. The Board shall also be responsible for hiring the caretaker. § 2: The six directors shall serve for three years, two being elected each year, or as otherwise required. § 3: Director positions that become vacant shall be filled by the Board of Directors until the Annual Meeting when a replacement shall be elected to fill the unexpired term. o	Ensure that the Constitution and the By-laws are upheld. o	Chair at least one sub-committee but no more than two. § 1: All funds collected on behalf of the Association shall be remitted expeditiously to the Treasurer. § 2: All transactions, other than for the care and maintenance of the property, must be approved in advance by a majority vote of the members in attendance at a regular meeting. The President shall preside over all regular meetings and all meetings of the Executive Committee. The President shall appoint all committee chairpersons who are not elected. The President shall propose and/or designate duties to the Directors. Whenever needed, and unless otherwise specified herein, the President may organize a committee and appoint a chairperson. The Vice President shall be familiar with the operations of the Association and either lead or participate on one or more committees. The Vice President shall act as the President in the President's absence. With the exception of funds pertaining to the Eye of the Hawk Range and Lodge Rentals, the Treasurer shall collect and hold all of the funds of the Association, and maintain an accurate, on-going accounting of all receipts and disbursements. The Treasurer shall pay all appropriate and authorized bills and invoices that are duly owed by the Association, and submit written reports of accounts and activities monthly to the Executive Committee. Additionally, the Treasurer shall provide and present a written report addressing the finances of the Association to all members attending the Annual Meeting. Moreover, the Treasurer shall be responsible for executing all Finance and Budget Committee recommendations that are approved by the Board of Directors. The Treasurer shall keep all Association investment instruments, insurance policies and certificates, and other key financial documents, in a safe deposit box. [The President of the Association shall also have full access to the safe deposit box.] In addition, the Treasurer shall include all investment transactions as part of the monthly Treasurer's report to the Board of Directors, and to the members at the regular monthly meetings. The Secretary shall keep accurate minutes at all Executive Committee Meetings, Regular Meetings, and Special Meetings. Further, the Secretary shall maintain the official files, handle all club correspondence and the newsletter, and oversee the content on the Association website at www.knoxcountybeaverlodge.org. Officers and committee chairpersons shall serve for one year and may be re-elected. Unexpired terms of officers whose positions become vacant shall be filled by majority vote of the Board of Directors. This committee shall be chaired by the Treasurer and be composed of no fewer than three and no more than five members. It shall be responsible for providing monthly overviews to the Board of Directors, monitoring and recommending all insurance required for the Association, and for proposing the annual operating budget. Additionally, this Committee shall provide ongoing monitoring of the Association's investments [e.g., CDs, Interest Bearing Accounts, et al.] and shall make appropriate recommendations to the Board of Directors at least annually regarding any changes that may be required. The Board of Directors shall have final approval of all matters assigned to the Finance and Budget Committee. At the Annual Meeting, and more often as needed, this committee shall provide a brief overview of its activities to the membership. o	Maintain a list of all members. o	Collect and deposit membership fees and report them to the Treasurer. o	Relay the names of prospective members to the Board of Directors monthly, to be voted on for membership. o	Inform new members about KCF&G rules and requirements, and the facilities and programs that are available to members. o	Report membership totals and related activities monthly to the Board of Directors and at regular meetings of the membership. o	Every December, advise all members that dues are payable by January 1, and that late fees will be applied thereafter. This committee shall be chaired by the Caretaker and is responsible for maintaining Beaver Lodge, the Caretaker's Cottage, and the Beach House. The Committee will ensure that all essential supplies are on hand and make recommendations for the Board of Directors' consideration when repairs may be needed to the those buildings and related facilities (e.g. well and septic). This Committee is responsible for maintaining the grounds, including Beaver Lodge Road, except for the Eye of the Hawk Range and the Beach areas. Should any work requiring expenditures be needed, this Committee will so advise the Board of Directors and seek their approval before proceeding. This Committee shall be comprised of the Range Master and at least two other members. It is responsible for establishing safe and appropriate operating practices for all users of the range, and for the maintenance and upkeep of associated grounds and structures. In addition, all organized shoots and other range events shall be planned and administered solely by this Committee. This Committee shall make a report addressing range activities monthly to the Executive Committee, at regular meetings of the membership, and at the Annual Meeting. The annual Memorial Clays Shoot funds the Bryant Pond scholarship. Each year, provided funds are available, the Range Committee will select one youngster for the scholarship. o	The annual schedule shall be decided by the Range Committee and published on the Range Page of the Association's website in January each year. o	All shoots are to be open to the public and supervised by a National Rifle Association Certified Range Officer or Certified Instructor (pistol, shotgun, black powder). o	All participants shall provide their own firearms, ammunition, hearing and eye protection. o	The Range Master and Range Officers will determine the fees for each event. o	Range Officers will set and enforce safety guidelines. Anyone not abiding by the rules or acting in an unsafe manner will be escorted from the range. This Committee shall be comprised of at least two members. It is responsible for establishing safe and appropriate operating practices for all users of the 3D archery range, and for the maintenance of associated grounds and structures. In addition, all organized shoots shall be planned and administered solely by this Committee. A report addressing range activities will be made monthly to the Board of Directors, at regular meetings of the membership, and at the Annual Meeting. This committee shall solicit and evaluate college scholarship applications each year. Provided funds are available, the Board of Directors will authorize a maximum of four college scholarship awards of up to $500 each. This Committee shall plan and direct a fishing derby each year during February. All aspects of conducting the derby, including prize selection and acquisition, ticket administration and derby operations, will be coordinated and administered by the Committee. This committee shall be responsible for all aspects associated with renting the Lodge, in accordance with the rules and guidelines established by the Board of Directors. A copy of the Lodge Rental Contract is included in the Appendix. This Committee is responsible for organizing and preparing all meals for regular membership meetings, for collecting the meal fees, as established by the Board of Directors, and remitting those fees to the Treasurer. The Executive Committee shall meet on the first Wednesday of each month, unless otherwise determined. A Special Meeting may be called at the discretion of the President, provided all Executive Committee members receive at least three days' notice. Meetings shall be held on the third Thursday of each month, except November and December, unless otherwise determined. The Annual Meeting shall be held on the third Thursday in May. § 1: A minimum of eight members shall constitute a quorum at all Executive Committee meetings. § 2: A minimum of ten members shall constitute a quorum for all regular membership meetings. A Nominating Committee of not fewer than five members (who may not be current Officers and Directors) shall be selected from volunteers in attendance at the February Meeting. When feasible, this Committee shall be chaired by an immediate Past President as selected by the Executive Committee. [A President must have fulfilled his/her post to be considered a Past President.] This Committee shall present the recommended slate of nominations to the membership at the Annual Meeting. All Officers, Committee Chairpersons, and affected Directors shall be elected for one-year terms at the Annual Meeting. Officers and Committee Chairpersons may stand for re-election if desired. No person may hold more than one Officer position, and any nominee for President must have been a Director of the Association for at least a year. Prior to the vote, the Chairperson of the Nominating Committee shall solicit those in attendance for any additional nominations. Votes will be tabulated and announced at the meeting. Roberts Rules of Order shall be the parliamentary authority for the Association on all questions not covered by the Constitution and Bylaws. These bylaws may be altered or amended by a majority vote at any regular meeting, provided that written notice of the change-which may be accomplished via postcard, an email, the newsletter, or on the Association website-is provided to members at least seven days prior to such meeting. § 1. We offer individual memberships only. The annual dues for a regular member shall be $100.00 (plus a 5.00 late fee for renewals paid after January 31), and $55.00 for a veteran ($5.00 late fee does not apply). A life membership may be purchased for $750.00. Dues and any special discounts (e.g., Mother's Day and Father's Day) are determined by the Executive Committee. § 2. Any member 65 years of age or older with 20 years of membership shall be a life member with dues and work incentive waived. § 3. Members may reduce their annual dues by participating in the work incentive program. Dues are reduced $5.00 for each hour worked at the club up to the cost of their membership. Respective club officers are to approve the scope of the work beforehand and verify the member's hours. 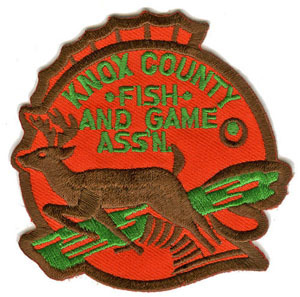 Campers must be current members of the Knox County Fish and Game Association. The camping season extends from May 1 through October 31 (water is turned off after Columbus Day Weekend). We have 40 campsites, of which 38 are seasonal and 2 are daily. To make a seasonal reservation, a non-refundable deposit must be received at least 10 business days prior to the reservation request date. Existing seasonal renters may retain their current site with the required deposit. All remaining unallocated seasonal sites are to be allocated on a “first come, first served” basis. The lodge can accommodate functions of up to 150 people. We offer two rates: one for weekdays (Monday, Tuesday, Wednesday and Thursday), and another for weekend days (Friday, Saturday and Sunday). All rental commitments require a signed contract with payment in full plus a security deposit. The security deposit will be refunded afterwards, minus damages, if any. Specific requirements, fees, and the rental contract (see Appendix) may be amended by a majority vote of the Board of Directors. The Appendix to this document consists of all the forms we use in the regular course of business. Each is listed separately and every one is downloadable. Click here to access the forms and documents.